I'm a computer programmer by trade, but I've always wanted to make computers do more than just number-crunching. I wanted to make them do things in the physical world. Turn lights on and off. Play sounds when a sensor is triggered. Make things move. Etc. Halloween seemed like a good way to work on this ambition. Since 1999, I have slowly been working on my electrical knowledge and improving the props I use to haunt my garage each Halloween evening in Penfield, NY, a suburb of Rochester. This web site displays my work from those years as well as provides information about the coming year's haunt. Mark's Haunted Garage is meant to be spooky, not gory. There may be scenes with things like skeletons, witches, demons, ghosts, and other assorted monsters. However, I do not do blood and guts. Personally, I find that disgusting, not scary, so I don't do it. There is also no profanity. As a result, if Mark's Haunted Garage were a movie, I would rate it PG. There are things in it that young (and sometimes not so young) children may be scared of, but there is nothing in Mark's Haunted Garage that I wouldn't have wanted my son to have seen or heard. So, young children are welcome if they have the courage to come through. Just remind them of the policy: touch nothing, and nothing will touch you. If that is not enough to encourage them to come through, please don't force them. We will be happy to give young children the candy even if they are too afraid to go through the garage. Just inform the person outside the garage, and he'll take care of you. 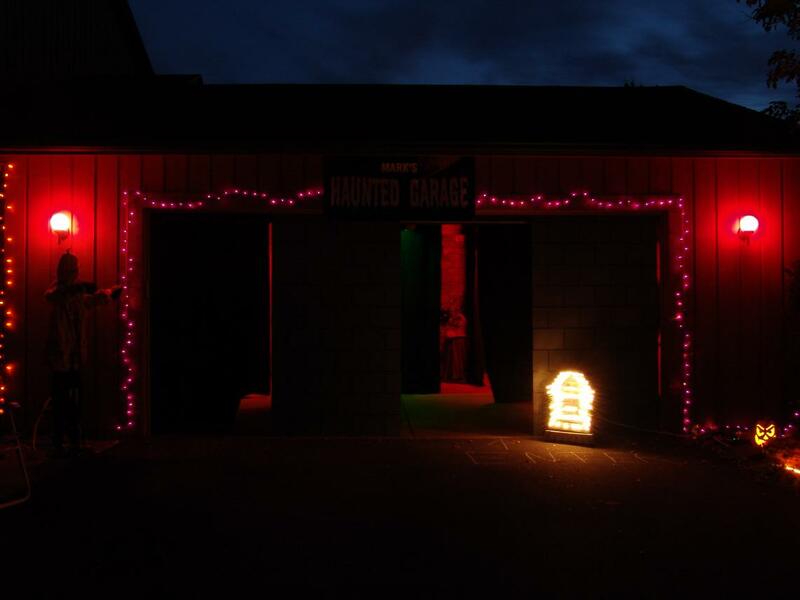 Mark's Haunted Garage is not just for the Trick-or-Treaters, though. We also welcome adults with no children. Whether you have children or not, by all means, stop in and take a look around. I don't charge anything for admission, and it only takes a couple of minutes to go through. I also wanted to mention that if you or your children attend Harris Hill Elementary School, you may have seen my work there. I have run the spook house during their Spooktacular event every year since 2007, and I will be running it again in 2018. However, I have decided that 2018 will be the last year that I participate in Harris Hill's Spooktacular. Mark's Haunted Garage is now on Facebook. You can become a fan if you like.